Whenever i go to Indian groceries, two vegetables i never forget to pick is okra and snakegourd. Dunno why these both veggies are our favourite and i do varieties of dishes out of them.I always love to cook snakegourd with coconut but this time this kootu is cooked completely with coconut milk. Yes this paal kootu goes for freshly squeezed or store bought tinned coconut milk, its all depends upon you. I prepared this paal kootu few days back for our lunch and served simply with a spicy potato fry and rice. Trust me, the sweetness of the coconut milk and the spiciness of the potato fry compliments very well together and we enjoyed thoroughly our lunch. This paal kootu goes seriously for easily available ingredients and nothing much to chop apart from the snakegourd and onions. Also this dish is very mildly spiced just with green chillies,kids can have this dish happily with rice without any complaints. A quick dish gets ready very easily and am sure you will definitely have a satisfying,filling lunch with this fingerlicking kootu. Heat oil, let crack the mustard seed and cumin seeds. Add the chopped onion,saute for few minutes, add the slit opened green chillies, cubed snakegourd pieces. Saute everything for a while with enough salt. Add the thin coconut milk, cook in medium flame until the veggies gets half cooked. Add in the thick coconut milk, cook until the veggies gets well cooked and the gravy turns thick. Kootu looks very inviting & yum. hey lovlely cute bucket!! btw pudalaingai kootu looks stunning!! Nice vegetarian dish. I don't think snakegourd is commonly found in Australia but maybe the Indian specialty shops might sell them. It must have been a million years since I last had snakegourd! This looks so tasty, Priya. Je découvre toujours quelque de nouveau en te rendant visite :je connais le gombo mais je découvre le snakegourd. Ton plat semble très gourmand et j'en goûterai avec plaisir. kootu looks very yumm and that bucket too looks cute..
Kootu looks awesome! Love it! Paal kootu and potato curry, that's a tempting combo, delicious kootu.. Such an easy peasy recipe and yummy too! 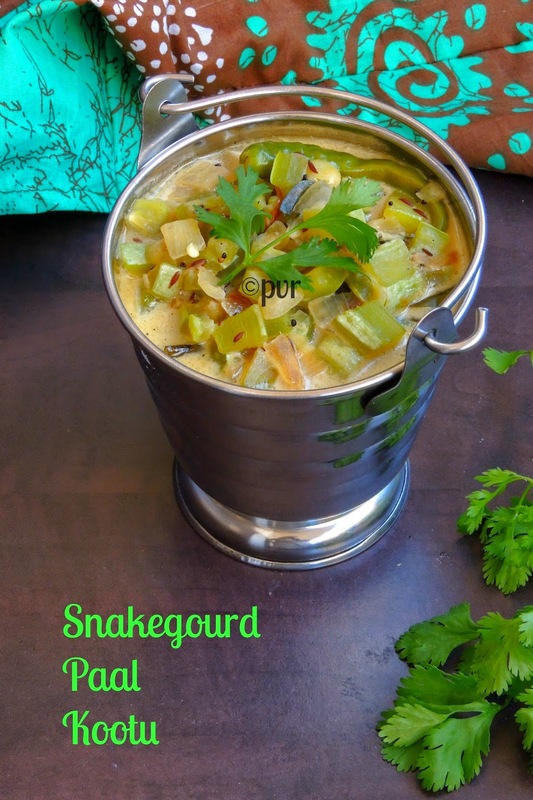 Love snake gourd...Will have to try your version..Like your presentation.